"My qualifications best position me to assist in leading a creative team in interactive branding. Know that I bring creative direction blended with traditional media and hands-on commercial arts skills. My candidacy brings much experience in this industry. For example, at Netscape, my team inherited the brand and I was charged with redesigning all aspects of Netscape. I sifted through all existing branding materials and logo asset files; identified all existing and possible implementations of the brand mark in browsers, Channel Portals, ISP applications and in the Netscape print and broadcast marketing campaigns -- successfully redesigning and strengthening the brand! Additionally, I directed my team in the systematic redesign of all Netscape logos, icons, branding elements and all style guide documentation. I performed the actual logo redesign. The browser application was the first product we launched with the new branding, followed immediately by the Netscape Network and then the ISP (Internet Service Provider). The project entailed many different graphic assets, formats, and support documents-- all of which were tightly controlled and distributed by my team under my leadership. We continued to be the single distribution point for all Netscape products and branding elements." Visionary, artistic, and strategic director with 14 years of expertise in creative staff direction, project management, and multi-platform creative design. Result-laden career in traditional media / branding; fused with a talent in emerging online technologies / web 2.0 (social media, digital, and e-commerce). International interactive branding with proficiency in web portals, multi-channel products and services; milestone brands and UX/UI. Background in an interactive agency, coupled with an accomplished career working with leading global interactive brands: Supervised design, production, product delivery, brands and applications for major internet and branding milestones at CompuServeTM, NetscapeTM, America OnlineTM and Time-WarnerTM. 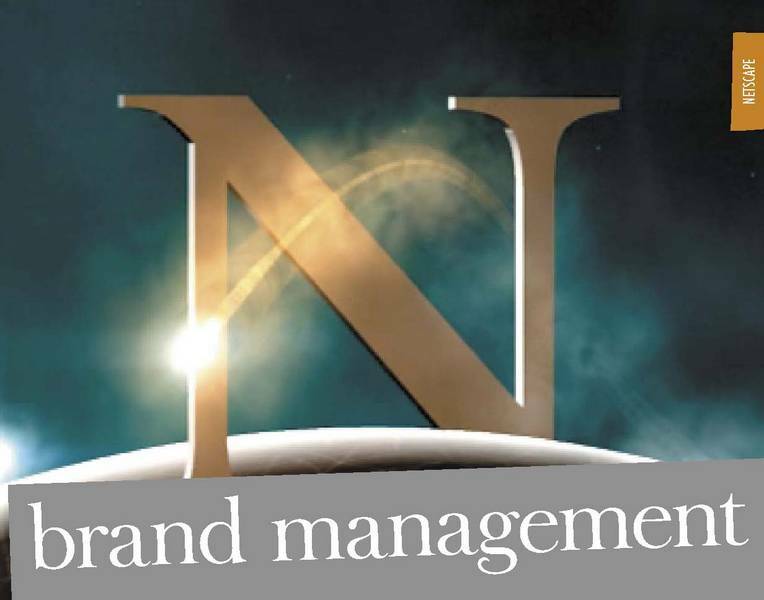 Strengthened Netscape's TM brand and product suite by steering global re-branding initiatives: Designed and managed browser, portal, media channels, print, and broadcast campaigns.  Directed a creative team of up to 20 in branding development: captivating branding elements (logos, marketing materials, video/broadcast, signage). 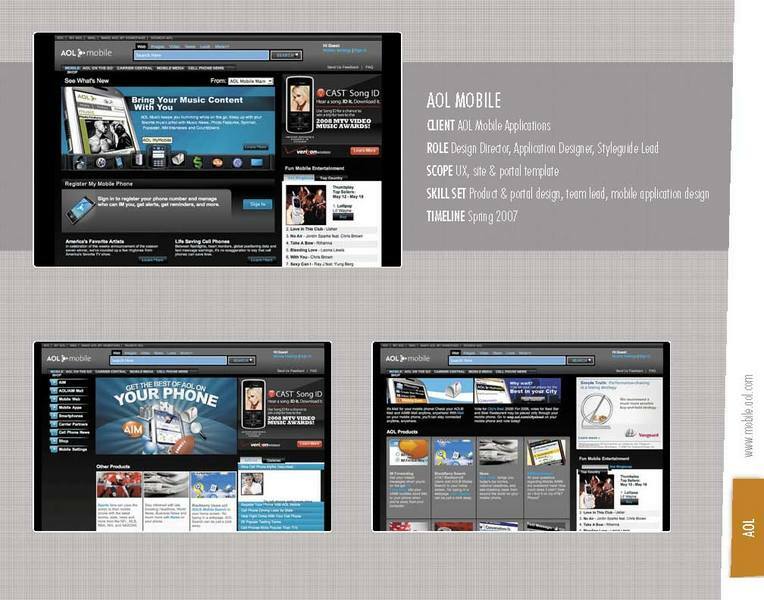 Developed styleguides and documentation for Netscape TM brand, adopted by the entire AOL/TimeWarner TM organization. Provided creative vision and strategic direction to UI designers on global re-brand, redesign, and launch of AOLTM International Portals. Developed customized, alluring, and memorable branding elements, design components, modules, styleguides, specification documentation for deployment of portal aesthetic and structure for over 120 individual properties.  Partnered with off-shore creative development team and individual country managers, aligning efforts to protect brand consistency, preserve original logo designs, and deploy site launches. 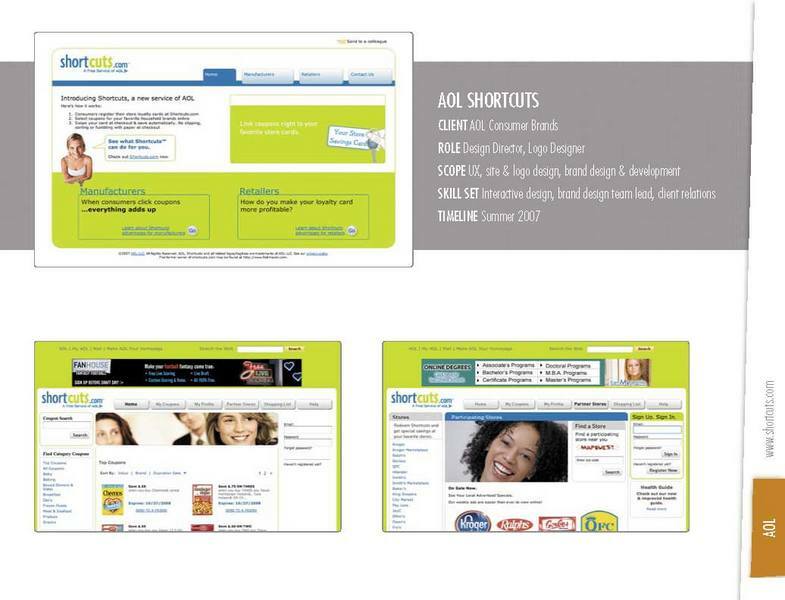 Directed a team of UX designers in AOL TM Shortcuts to develop consumer benefits and retention product and brands. Communicated a clear creative vision; built high-performance, cross-functional teams, anticipating emerging technological advances and usage needs.  Developed logo, messaging, usability models and specifications documentation for Engineering. 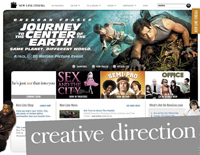  Directed design of all branded promotions for Web, Print, DirectMail, and consumer materials.  Conceptualized and execute creative branding ideas that increased success and profitability via the out-of-the-box ideas and action-provoking design methods. 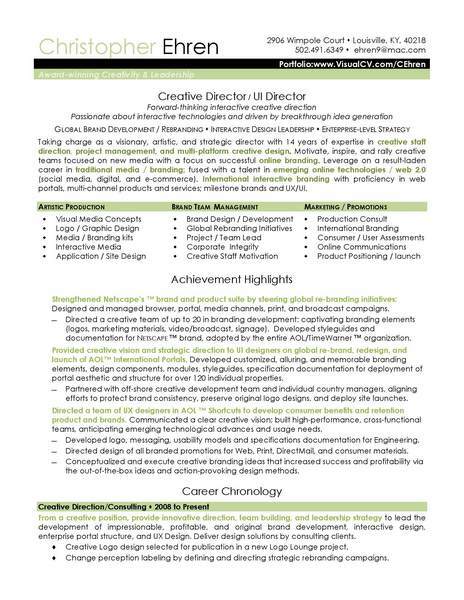 From a creative position, provide innovative direction, team building, and leadership strategy to lead the development of impressionable, profitable, and original brand development, interactive design, enterprise portal structure, and UX Design. Deliver design solutions by consulting clients. Creative Logo design selected for publication in a new Logo Lounge project. Change perception labeling by defining and directing strategic rebranding campaigns. Inspired creative teams in the design of AOLTM International Brands, NetscapeTM, Time-Warner ProductsTM and their clients, including HPTM, DellTM, Wal-MartTM, and SonyTM. Held staff meetings to brainstorm and spark creativity. Refined brand strategies, consistently exceeding goals and expectations. Led design development, product launches, logo designing, production sets, presentations, new business development, and branding material creation to attract targeted demographics. 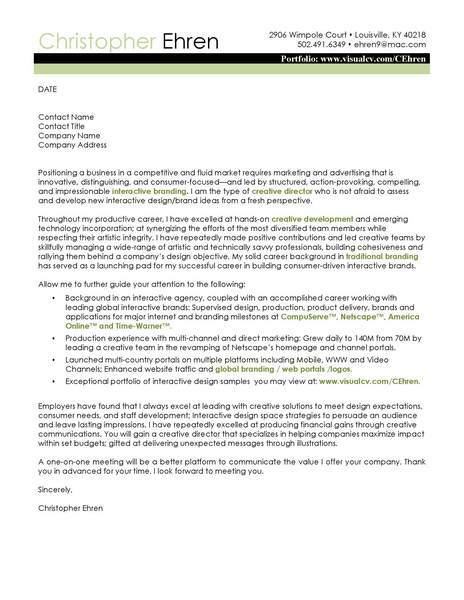 Key in maintaining strategic vision by strengthening relationships between International design and branding group's with clients, partners, product managers, and business managers. Inspired and provided creative leadership to 6 direct reports and a 20-member creative team. 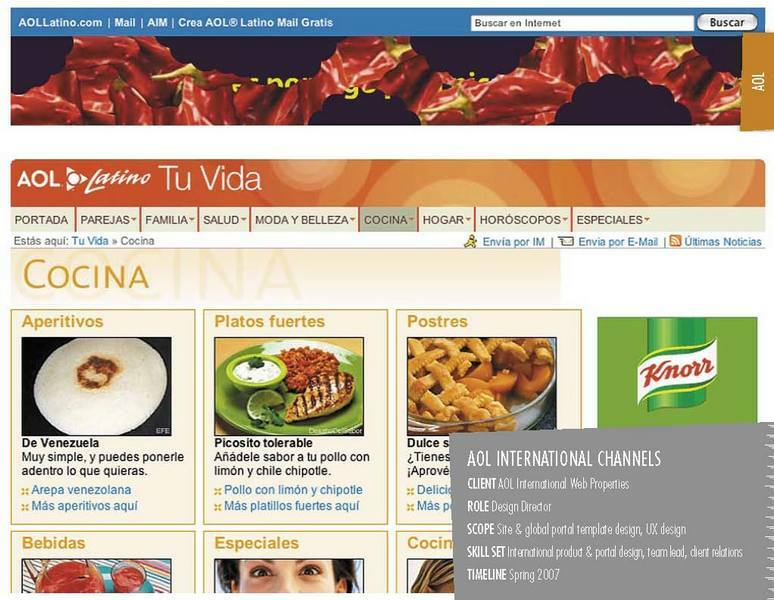 Designed and launched AOLTM International Portals and Channels for 35 countries via the creation of Global Branding Guidelines. Re-launched Wal-MartTM Connect and NetscapeTM ISP products and marketing campaigns, increasing dominance in the market. Direct the creation of visual concepts by leading a creative team in the attention-capturing designs of products and commercial/corporate brands. Managed UI and visual design projects, including portal design, mapping and strategy, consumer-facing sites, and promotional micro-sites. Established and nurtured key relationships with internal/external customers. Identified talent, recruited, and amassed remarkable creative staff members. Bolstered market penetration of CompuServe (internal) and Wal-Mart Connect by restructuring and rebranding both online and print marketing programs with more alluring campaigns. Created AOL Time WarnerTM Internet product branding and graphics programs. Devised and deployed Flash games to engage and capture return visitors. Enhanced sites' appeal by modifying 3rd-party games and features for incorporation into AOL, Netscape, and CompuServe channels. Oversaw design and graphics delivery for CD-ROM multimedia magazine. Enabled rich media content broadband Internet service by creating interface and content. Optimized graphics and application delivery by revamping templates and design models. 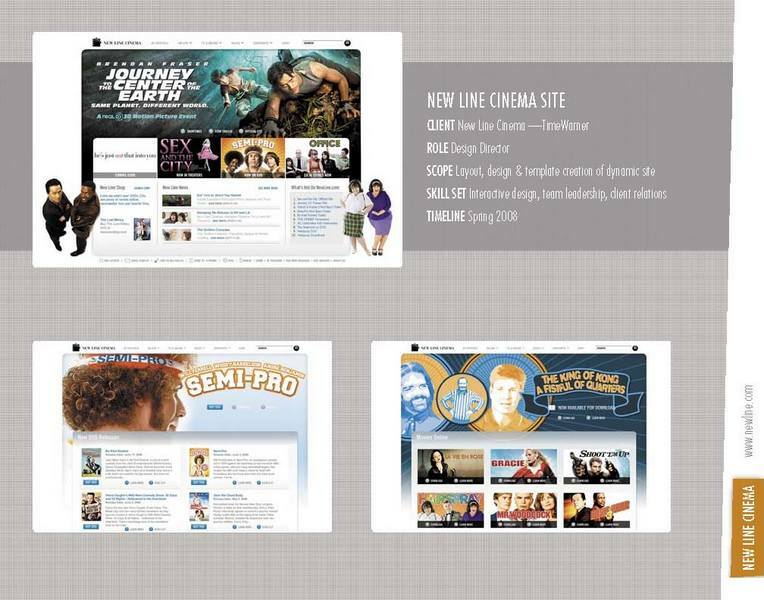 Tripled return traffic by designing Flash games and templates for Celebrity and Movie Channels. Earned Gold Award for CD-ROM multimedia from New Media Invision Awards, Optima Design Silver Award for CD-ROM Packaging Design and New York Design Festival Bronze Medal for Interactive Multimedia.